We cordially invite you to Nerds Unite 2018. 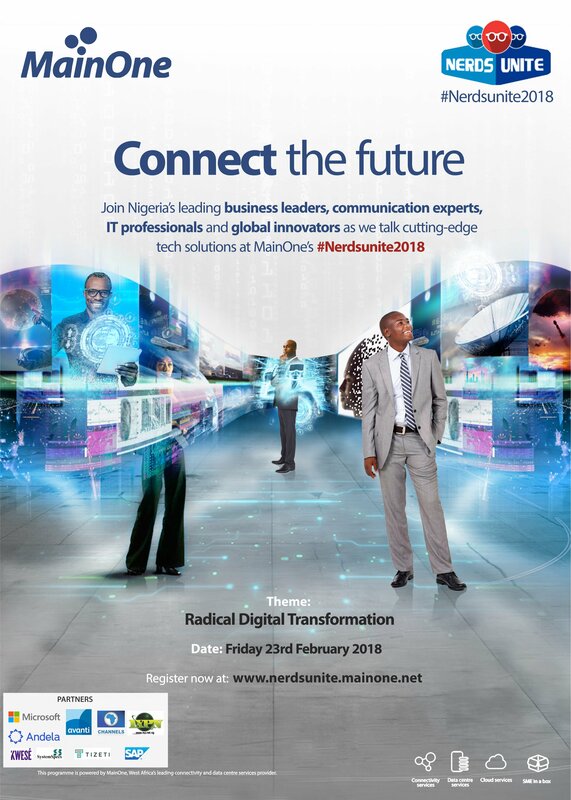 Nerds Unite is MainOne’s premier event to share new industry trends and developments with over 500 IT managers and professionals in Nigeria. In the course of the one-day programme, influencers, decision makers and professionals from blue-chip organisations operating in all sectors in Nigeria will connect, network, share ideas, discover new opportunities and discuss breakthrough trends in the global IT space. Attendance is free. Please register to attend this event at www.nerdsunite.mainone.net OR CLICK THE IMAGE ABOVE. Registration is compulsory. An e-invite will be sent to you to confirm attendance after registering. Kindly print this invite and bring to the venue on the day of the event.